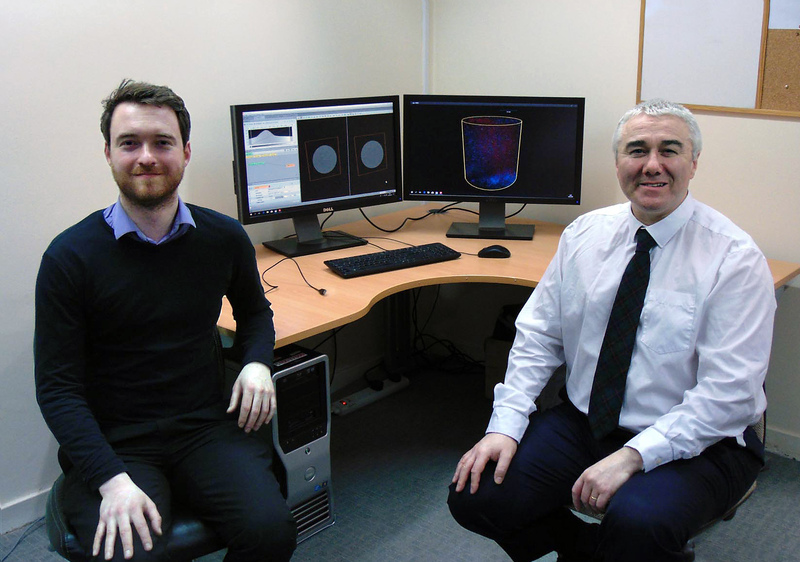 Scottish company improves the way it interprets Nikon Metrology’s CT scans of rock core samples. Pictured: Leigh Wright – Geologist at Premier, COREX (L) and Ian Patey – Manager Formation Damage and Stimulation Group at Premier, COREX (R). The firm has been providing these services for more than 30 years but it is only within the last decade that it has augmented its rock core investigations by sending samples for analysis approximately every week to Nikon Metrology’s centre of excellence for microfocus computed tomography (micro-CT) in Tring, Hertfordshire. The systems and the X-ray sources that power them are manufactured on site in three factory units, with further areas devoted to service and support. The company also provides subcontract CT scanning services using its own equipment, which doubles as a demonstration facility. “Micro-CT scanning is the key technology, as it is central to providing a true picture to our clients.” – Ian Patey – Premier, COREX. Ian Patey, Manager Formation Damage and Stimulation Group at Premier, COREX explained, “Operational fluids are used to assist the drilling and completion of boreholes by providing hydrostatic pressure and preventing formation fluids from entering the well bore, as well as to cool and clean the drill bit and evacuate drill cuttings. We advise on the best drilling fluid to use for a particular job to avoid formation damage and limit corrosion. “The fluids inevitably interact with the wellbore, changing the structure and porosity of the rock which can in turn restrict or increase the flow of gas or oil from the reservoir. In the former case, hydrocarbon recovery is compromised. One member of staff in the Aberdeen laboratory closely involved with this work is formation damage geologist and project coordinator Leigh Wright. He commented, “Being able to simulate wellbore operations and reservoir conditions accurately, whether to pre-screen a proposed operation or troubleshoot an existing project, requires data from rock samples taken using an array of different equipment for observation, measurement and chemical analysis. “However, micro-CT scanning is the key technology, as it is central to providing a true picture to our clients. 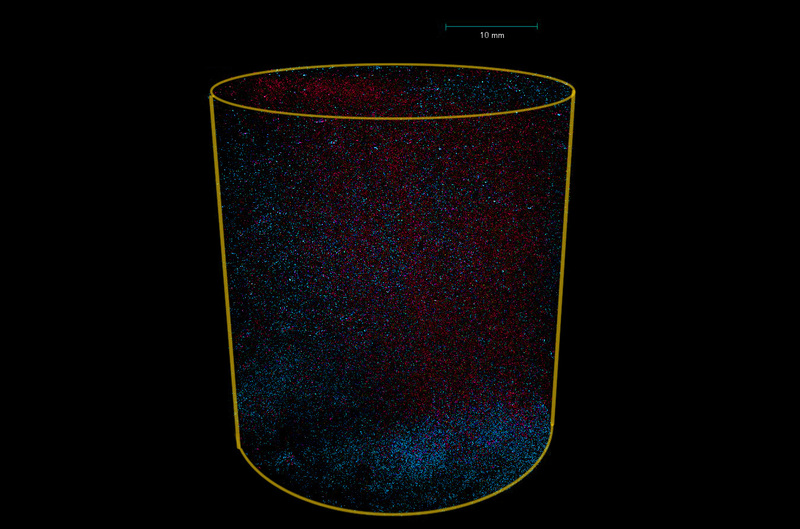 We have found that simple before-and-after permeability measurements on a sample can be a misleading metric to predicting oil or gas flow impairment. Ian Patey – Manager Formation Damage and Stimulation Group at Premier, COREX. 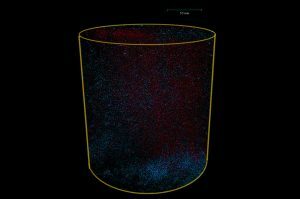 The images and data sets produced can show grain size and shape, pore size and network, cements and mineralogy and can potentially visualise fluids and saturation. Micro-CT scanning adds value to Premier, COREX’s formation damage testing procedures by aiding interpretation and reducing risk to operators. Rock samples flown down from Aberdeen to Tring are typically 25 to 38 mm in diameter, 25 to 50 mm long. A team of Nikon Metrology applications engineers is on call and has at its disposal six of the company’s machines to perform subcontract inspection. Turnaround time for Premier, COREX’s receipt of results is two days, including flights. The resolution of a typical medical CT scanner would be sufficient to show coarse features but not individual grains, pores, micro-fractures, voids and fine features. 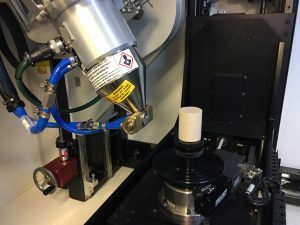 Conventional testing techniques such as scanning electron microscopy and thin section are commonly used to understand what has happened within core samples and they provide valuable data. However, they are destructive testing procedures and unable to examine the entire volume of a core sample to show distribution of damage quickly or cost-efficiently, so there is potential to miss the mechanisms involved. Premier, COREX has a patent (GB (granted): GB2524810 and US (publication number): US2017108483) to take its rock core analytical services a step forward by using volumetrics to quantify the alteration to the sample over time. Micro-CT scanning will be pivotal to its successful application. Nikon Metrology has over 30 years’ experience in X-ray and CT inspection and has been offering contract inspection services since 1997. Its facilities support one-off projects up to large batch inspections in many industries including aerospace, automotive, Formula 1, telecoms and pharmaceuticals. Samples examined range from the latest microchip to a 65 million-year-old dinosaur egg. Results are supplied in short turnaround times as easy-to-understand, customer-tailored reports with still images or complete data sets. If required, interpretation of results can be carried out by Nikon Metrology’s experts. Alternatively, training sessions are available enabling customers to operate X-ray or CT systems themselves in order to carry out their own inspections at centres around the UK. Learn more about Nikon Metrology’s CT inspection services. The microfocus sources produced in Tring exclusively for Nikon Metrology’s own CT systems reveal very fine detail. Exclusive, high-flux, rotating targets enable fast scanning times. The non-destructive technique preserves the item under examination, which can often be expensive, enabling material analysis, assembly evaluation and metrology CT. Accurate simultaneous measurement of internal and external dimensions is possible, plus comparison with CAD models and GD&T (geometric dimensioning and tolerancing). The six micro-CT machine models in Tring available for contract inspection are XT V 160, XT H 180, XT H 225 ST, MCT 225, XT H 320, XT H 450, the number designating the power of the X-ray source in kVA. In summer 2018, a walk-in facility will be opened able to cope with components or samples as large as 2 metres high by 1.5 metres across.